Perfect as a vegetarian main course, perfect for Meatless Mondays! 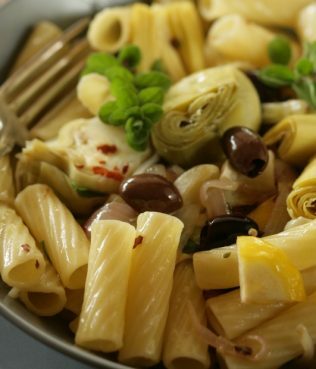 This dish hails fromt he island of Milos, but similar dishes are made all over Greece. Artichokes grow mainly in the Peloponnese, Crete and Tinos in Greece and they are one of the oldest cultivated vegetables in the whole Mediterranean. This hearty vegan stew calls for great olive oil, which you can find by going to my online store here. Squeeze 1 lemon into a bowl with 3 cups of water. Trim the artichokes: Cut away their tough outer leaves, leaving a little of the stem intact. Trim the tough exterior with a paring knife. Using a teaspoon scrape out the purple, fuzzy choke. Rub the artichokes with the squeezed lemon half and place in the acidulated water. Preheat the oven to 350˚F/180˚C. Peel the potatoes and cut into quarters. 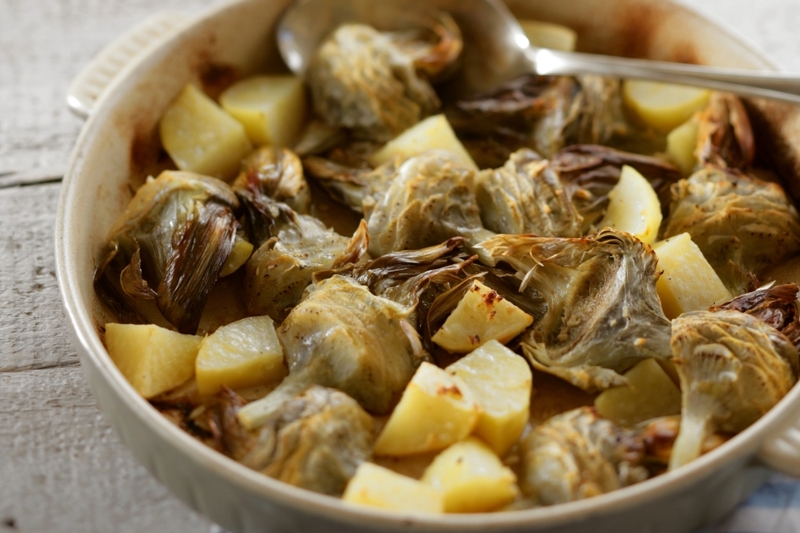 Toss the artichokes and potatoes with 1 cup of oil, garlic, the juice of the remaining lemon, and a little sea salt and pepper. 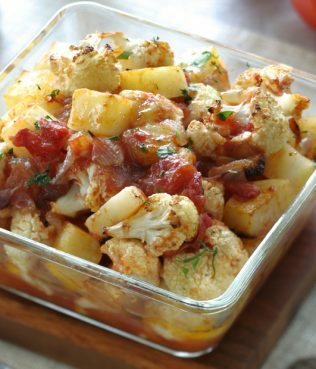 Spread the mixture evenly in a baking pan large enough to hold the vegetables in one layer. Bake for about 1 hour, until the artichokes and potatoes are tender. About 5 minutes before removing the pan from the oven, place it under the grill, about 8 inches/20 cm from the heat source, so that the artichokes and potatoes acquire a crusty brown texture and color. Remove and serve immediately.